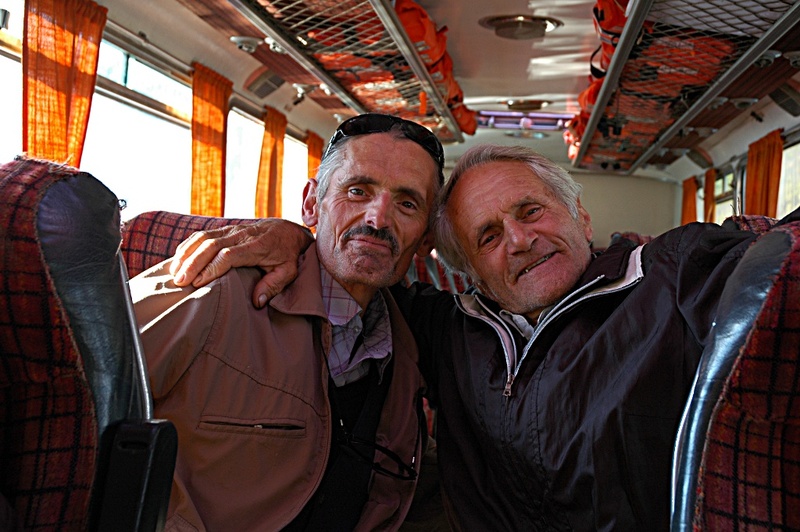 The trip from Budva to Shkoder, my base for the three days to come, was the first to make bus connections. Once in Albanie, I realized that many things are different here from anywhere else. The country gives an ideal opportunity to test ones own limits for traveling. There is a direct bus from Budva to Ulcinj, from where one can catch a direct bus to Shkoder in Albania at 6am and 12:30am. I was suggested to leave Budva around 9am in order to make the 12:30 bus in Ulcinj. Since the direct bus from Budva to Ulcinj only leaves in the afternoon, I chose to take a first bus to Bar. According to the schedule, the bus leaves Budva at 9:40, taking about 1 hour to Bar. If the bus is on time, the connections works perfectly, but of course, my bus was late. The different buses in Montenegro are often run by different companies, but the connections seem to work better than with Deutsche Bahn. When we arrived in Bar, the bus to Ulcinj was just leaving. The driver asked me, whether I needed to got to Ulcinj, which I answered with “da”. He then started waving the the other busdriver indicating him to stop, which he did. This was the first time I changed buses halfway between the gate where buses enter and leave the bus station and the platforms. Once in Ulcinj, I had about 40 minutes before the bus for Shkoder left. So I could hang out in the café adjacent to the bus station and enjoy one last coffee in Montenegro. The road between Ulcinj and Shkoder is marked on many maps as a main road. I wonder why the bus had to stop so many times on this road to let other large vehicles cross. That things aren’t quite as easy in Albania as in other countries, I figured quite quickly myself. Finding a place to sleep was easy, since I had two names of hotels right in the center, which offered rooms for reasonable prices. However, finding out when a bus leaves to some other place and where it leaves from is a whole different story. There are no bus stops or bus stations whatsoever. The only source of information are the people. And finding somebody who knows the information you need and you can interact with is also a challenge. The Albanian language is not closely related to any other language and the second language is Italian, but also not readily spoken. Where does the Komanit lake go? In the end, I had the information from which square a bus would be leaving for Koman at 6 o’clock in the morning (the only connection during the day). I arrived at 5:45 at the square and sat in a café to drink a coffee. I then asked the people in the café, where exactly the bus was leaving from and they indicated, it was one block down the road. A driver of a furgon picked me up on the way and told me, that he only was leaving at 6:30, but there should be no problem catching the boat in Koman. To kill the time until 6:30 he invited me to a coffee. Nice move. The road to Koman was a dusty dirt road with wholes all over. 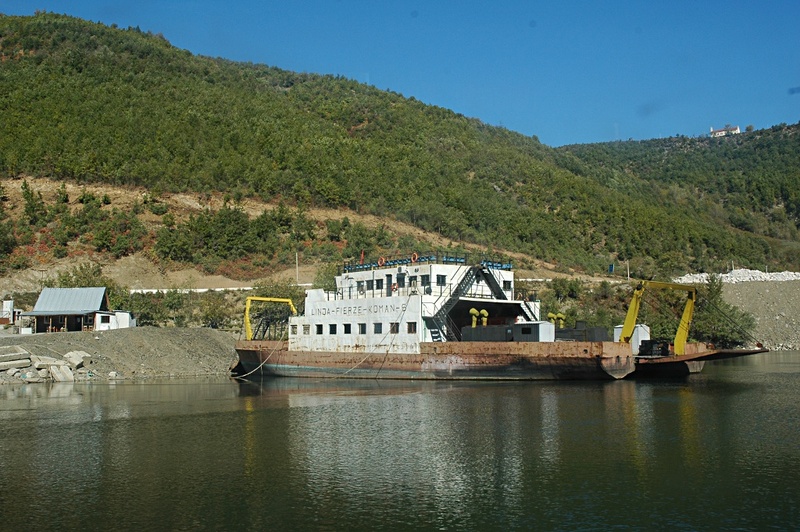 A few minutes after 8 o’clock, we arrived in Koman, where I had enough time to catch up on breakfast, which I hadn’t had in Shkoder and the boat for Fierze was only to leave at 9:00. The boat arrived a few minutes late, but immediately turned around and left for Fierze. 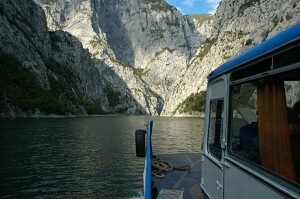 The boat ride across the Komanit lake is supposed to be the most beautiful boat ride on the planet. Along with interested local people and a Belgian tourist, who spoke at least a few words of Albanian, the trip was also to be quite entertaining. In the end, even a glass of home-distilled liquor made the round. 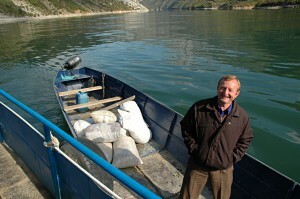 We even helped a poor fellow out, whose boat engine had broken down, by towing him to Fierze. The interesting part about our boat was the fact, that it was half boat and half bus. The bottom part is a normal boat, but the cabin is a completely equipped bus, including windows, seats, luggage compartment and doors. Therefore there is one driver door on the left hand side of the cabin and two passenger doors on the right hand side. The life vests are stored in the luggage compartments (and not under your seat). The most intriguing part about this trip was, that I had no idea of how to get back to Shkoder, once in Fierze. Judging from the map, I assumed there was a direct connection with a furgon back to the city. But there wasn’t. 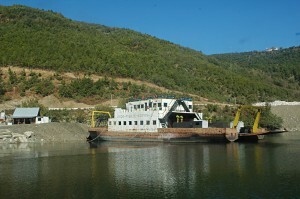 The next boat in the opposite direction was only to run the next morning at 8am. Discussing the matter with the Belgian fellow and the locals, it turned out, that the easiest way out of this Northeastern corner of Albania, was to catch a furgon to Bajram Curri, which takes about 30 minutes, and then catch a bus from there to Tirana, from where I could head back by bus or furgon to Shkoder. The bus leaving Bajram Curri, at least that is the information we got from the locals, would leave the town in the Albanian mountains at 2pm. So there would be some time for lunch there. However, when we arrived at 1pm, the bus for Tirana was already all set for departure. So I thanked the Belgian fellow and jumped in the small bus headed from Bajram Curri to Durres via Tirana. He also explained the driver, that I needed to go to Shkoder, and he should drop me off at a convient place. 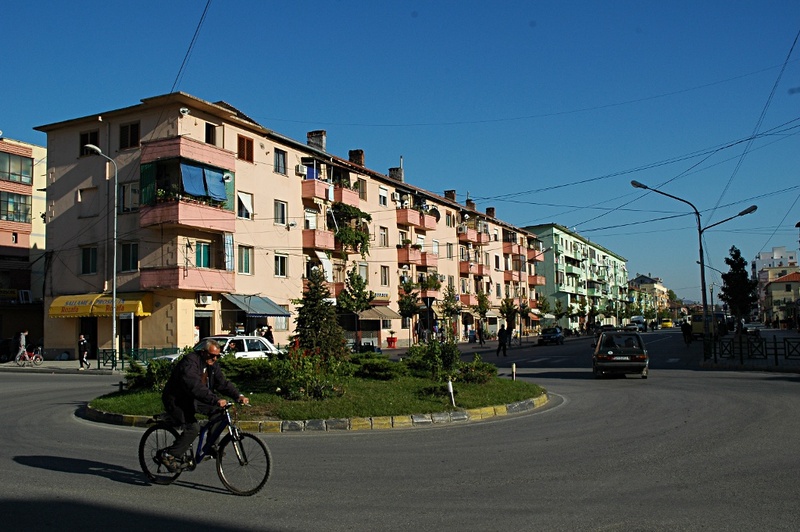 The bus connection from Bajram Curri to Tirana leads through the back door of Albania. This means that we had to cross the border into Kosovo and after about 90 minutes back into Albania. Good thing I had my passport with me in my daypack… Unfortunately I again did not get any prove, that I briefly visit Kosovo, since no stamps were made in the passport. Fortunately the bus driver rememberd, that I had to go to Shkoder and dropped me off in Milot on the main road between Tirana and Shkoder. A taxi driver already stood there waiting (I still wonder whether this was a coinicidence…). The taxi ride went smoothly and I got my next lesson for the day: even if you think you understand the price he is asking, double check using your fingers. The first foreign language of the Albanians is Italian, and the price he was asking sounded like 7 Euros, to which I had gladly agreed. However it turned out, that he had not used an Italian word, but an Albanian one, and that meant 20 Euros… A little bit frustrated, I handed him the 20 Euros, but was later told, that that was a fair price. Once I was back, I immediately headed for a restaurant to get some Albanian food. The first Albanian specialty was, that there was no menu. The waiter just asked, whether I wanted to have the same sampler was the guy at the table next to mine. After making sure I knew the price for the menu, I agreed. At another table, they were celebrating a birthday, offering some cake to all the people in the restaurant. So I took the cake, went to the fellow whose birthday it was, wished hime a happy birthday and asked whether I could join them at their table. Definitely better than sitting by yourself. The group consisted of two woman about in their fifties from England and Australia, two younger Albanian women and a younger fellow, whose birthday it was. The four ladys support women groups in the whole world and the guy is the cousin of one of them and supported them with his driving skills. Since it was a merry round, again some liqueur was served. Full of food, I headed out to an Internet Café to complete the last post before heading back to the hotel. After this strenous day, I decided to relax on Friday. Instead of another long trip to the mountains in Theth, I decided to visit the city, lake Shkoder and the Rozafa fortress. On foot I set out to find out, whether I could reach the lake shore. After about an hour, I could see the lake ahead across some open fields where farmers were herding their cows. Since I had already gotten some suspicious looks walking that far, I decided not to challenge my luck and turn left towards the Rozafa fortress, the main tourist attraction in Shkoder. The fortress lays at the edge of town a few kilometers from the city center on top of a rock. To find the road leading up to the fortress, I had to walk around the rock for almost a full circle. Entering the fortress, I read about an entrance fee of 200 Lek, but there was noone to be seen who would collect the fee. Once I arrived on top of the fortress, I was mildly surprised how expansive the fortress is. Not only large in extent, but there were also quite many tall remains left. From the fortress, I also had a great view across the city, lake Shkoder and the mountains in the distance. The dark clouds approaching from the North however indicated, that it was soon time to move on to a protected place. That’s what I did, heading back to the city center, this time by city bus. On Saturday at 10:00am I will leave Shkoder for Tirana, to find a bus to Thessaloniki in Greece. Let’s hope the best for the country on strike… The next destination after Thessaloniki in Greece will then be Istanbul. Have you been there before? If so, which places are worth a visit? I’ll be happy to receive any suggestions as comments to this article. 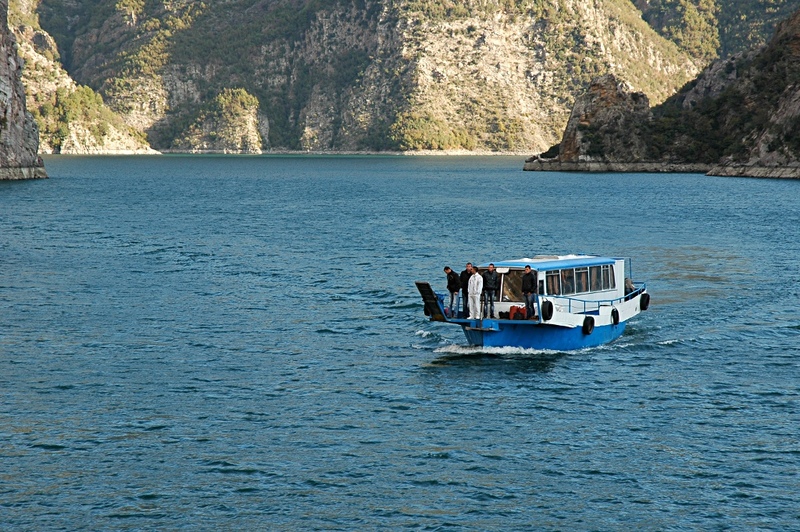 This entry was posted in Silk Road, Travels and tagged Albania, Boat, Bus, Shkoder by Oliver Meili. Bookmark the permalink.